As a next step in the contract negotiations for Contract Academic Staff (CAS) the Wilfrid Laurier University Faculty Association (WLUFA), which represents CAS, has requested a No Board report from the Ontario Ministry of Labour. WLUFA has been in negotiations with Wilfrid Laurier University since May and met with a conciliator on Oct. 23 and Nov. 4 to continue discussions. The No Board report has yet to be approved, but the request means that in approximately 20 days the CAS will be in a legal position to strike. This puts pressure on both sides to come to an agreement and, as Crowley noted, this generally leads to a mediator being brought in to help with negotiations within the 20 day period. Crowley emphasized that the university is focused on getting back to the table to continue discussions. But the university, he said, is taking into consideration the fact that if no agreement is met by the end of the 20 day period, CAS can choose to strike. In terms of the bargaining that has been going on since May, Crowley commented he thought it had been productive as well as in terms of the conciliation. Herbert Pimlott, communications director for WLUFA, explained the reasoning WLUFA had for making the request. He also pointed out that employers are able to lock-out their employees, meaning that they will close the workplace so employees can no longer come in to work. Pimlott also expressed the concern he felt over a press release the university published on the Laurier website on Nov. 7 about WLUFA’s decision to request a No Board report. “I understand back in 2012 in February and March they started emailing students before and after reading week and this caused a lot of undue stress and anxiety among students,” he said, referring to the negotiations that occurred between the university and WLUFA in 2011/12. “We will be disappointed if they start doing this again because it’s part of the process,” Pimlott continued. 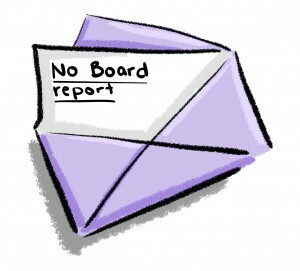 He emphasized that students should know a request for a No Board report is not unusual. Even if an agreement is not met by the end of the 20 day period, CAS may not strike. As of now, no meetings have been scheduled for the two sides to continue talking.